If you would like to learn more about the H-1B visa, please continue to read our article, part of our guide on US visa types. Moreover, if you are an employer or an employee working with an employer and you know that you need help with the H-1B visa process, please contact us. We have filed numerous H-1B visa applications for employers in our usual service area, Montana, North Dakota and Wyoming. However, immigration law is federal and we can help you wherever you are located. Currently, the H-1B visa program works as a kind of lottery. If you are unaware of this, we therefore suggest first reviewing our description of the lottery problem. If you understand the current conditions, please read on. 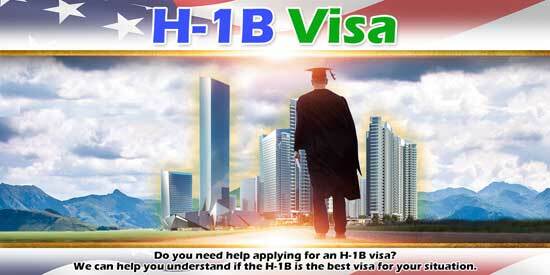 The H-1B visa program is for employers. You must have an employer employee relationship in order to petition USCIS for the workers you desire to hire. As an employer, you cannot use the program to hire a contractor. The USCIS model for this visa requires a commitment to pay wages, and offer full time employment. Next, you must be offering specialty employment. Both the DOL and USCIS intend this to mean that the job description normally requires a bachelor’s degree. An employer can fulfill this requirement four ways: 1. The DOL Occupational Outlook Handbook (OOH) specifies that most people working in the position have a bachelor’s degree. 2. The bachelor degree requirement for the position is common in the industry. 3. The employer normally requires a degree or its equivalent for the position. 4. The nature of the duties of the position are so complicated that the knowledge to perform them is usually associated with a bachelors degree or higher. For employers offering specialty employment, the TN (Trade NAFTA) visa might be a better option. But, it is only applicable if the prospective employee is from Canada or Mexico. Also, TN visas are not available for every degreed position. To see if a TN visa might be a good option, check out our TN visa guide. The simplest H-1B visa applications to prepare and file are those where the employer can use the first alternative, referring to the OOH. The USCIS never disputes the requirement for a bachelors degree if the OOH specifies it. Other ways of demonstrating that a position requires a bachelors degree often need more work. They are also subject to USCIS challenge. If it is reasonable that the offered position requires a bachelors degree, the USCIS’s next requirement is that the prospective employee have a bachelors degree or its equivalent. For example, if the employer is an accounting firm, and the position offered is that of accountant, the prospective employee needs to have a bachelors degree in accounting. If the employee’s degree is not from a US university, the USCIS requires an evaluation. That evaluation must show the employee’s degree is equivalent to a US bachelor degree. The less overlap between the employee’s degree and the requirement of the employer’s position, the more complex the H-1B visa application becomes. For example, if the employer has a marketing position and the employee has a degree in business, it can be challenging to get the USCIS to approve the application without resort to transcripts of marketing classes and reference to professors of business and marketing. Once we establish the fit between the employer’s position and the employee’s education, the next question is the pay for the position. Congress when it established the H-1B visa was acutely aware of the problem of US employers preferring foreign workers. Its assumption was foreign worker might work for less than their US counterparts. To deal with this possibility, Congress established a prevailing wage requirement through the Department of Labor. Once the employer has the correct job description, the employer submits the job description to have DOL set the prevailing wage. This prevailing wage depends upon experience and education required. Positions that only require a bachelors degree have the lowest requirement. A position that required a Masters degree and 10 years experience would have a much higher wage. The H-1B visa application sometimes founders at this point. Once the employer receives the wage set by DOL, the employer may find that the wage is too high. It is out of sync with standards in the employer’s business and region of employment. The application founders because as part of the process, the employer must commit to pay the employee at least the prevailing wage. This commitment is made through the Labor Condition Application (LCA) process through application to the DOL. USCIS requires a certified LCA to approve the H-1B visa petition. With the wage issue and certification dealt with successfully, the next step is filing the application with the USCIS. As described above, if the application is submitted in the first week of April and selected by the USCIS, the employer has gained the chance for an H-1B visa. Assuming the USCIS approves the petition, the employee can start work on the first day specified in the petition. USCIS provides for three years for each petition. So winning the H-1B visa lottery is worth it if the employer has a longer-term need for the employee’s services. Moreover, USCIS allows a total of six years and H-1B status so the employer may renew the H-1B for the second three year period. The renewal is not part of the lottery. While we have worked with employers all over the United States, most employers who utilize our services to file H-1B visa applications are located in Montana, North Dakota or Wyoming. If you are employer located in these states and need help filing in H-1B visa, please contact us.